June Partridge Zintz, Founder of our Society, died suddenly on Sunday morning, 7 October 2007, while in the hospital recovering from back surgery. She had celebrated her 80th birthday with her family and many friends in May amid much happiness and was looking forward to another research trip to Salt Lake City in January with Irene Rupp and a river-cruise on the Danube in the spring. She had compiled this issue of the JOURNAL and submitted it for proofreading just before going into the hospital. June Eleanor Partridge was born in Hamburg on 23 May 1927. She graduated from high school there in 1944, after which she attended concentrated classes in drafting given by Cornell University in preparation for work in the war effort at Curtiss-Wright, where she did drawings for airplanes. Later she did drafting at various other local firms, sometimes working from home, and finally retired from Trautman Associates. 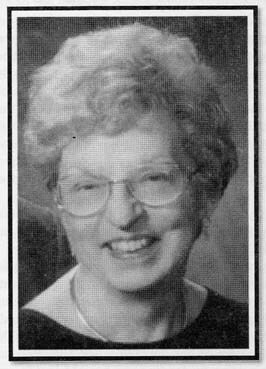 She was married to Norman C. Zintz Sr., who operated an auto painting shop in Hamburg for many years and then managed Lakeside Cemetery. He died in 2004. She is survived by a son, Norman C. "Skip" Zintz Jr., and a daughter, Sondra Gagnon, 8 grandchildren and 5 great-grandchildren. We first got to know each other when I phoned in reply to the classified ad that she placed in the (then) Buffalo Evening News. It read "Are you interested in genealogy? Descendant from early Western New York settlers? Like to exchange information? Meeting Friday Jan. 25th [1974.] For details call Mrs. Norman Zintz 649-1129." We "hit it off" at once, and talked for hours about genealogy and her plans for the new group. I was working in the old history department at the downtown library at the time, waiting for a teaching job to become available, and had a fair amount of free time to volunteer. For some long-forgotten reason, however, I was unable to attend the organizational meeting, thus my "high" membership number of 13. A "news release" of 27 January recounted the events of the 25th and obtaining a charter was already being investigated. Being chartered as an educational institution by the NYS Board of Regents was a major milestone for the Society; all the original officers had to be investigated by the State Police before it was granted! June was a very intelligent woman with very high standards, as her son so accurately noted during the memorial service. Relying on her experience as registrar in her DAR chapter and as a member of the Central New York Genealogical Society, she had ambitious and far-sighted plans. The necessary committees, officers and Board of Directors were already envisioned. A quarterly journal of 48 pages would be published. She designed and drew the logo for the Society which has appeared on the front cover ever since, and later drew the county maps that appeared in the JOURNAL. She arranged the programs and the meeting place at Lancaster Country Club, where she was a member. June, of course, was the first President of the Society, and I was Vice President and editor of the JOURNAL. I often kidded her that my role as Vice President was easy, since I only had to stand by in case she was "assassinated or impeached." The JOURNAL, however, was another matter. In the days of off-set printing, "photo ready" copy had to be prepared by having everything typed on an IBM "Selectric" typewriter and then literally cutting and pasting up each page. June, of course, was the first typist. She has already written about the means by which we were able to afford the expensive typewriter: she placed a bet on a horse and it came in first! It was our little joke, however, because some of the straight-laced early members would have quit had they known that gambling was involved! There were the usual number of growing pains, including people who dropped out or did not come up to June's standards. I was not strictly speaking the first person to be named editor of the JOURNAL. After several editorial meetings it became clear that the original volunteer was not up to the job and resigned and was replaced by two of us who were already on the committee. My co-editor quit after June confronted him with faking some information that was going into the JOURNAL. So by the time the first number came out I was, if not in actual name, the sole editor. (I completed work on a number of the articles but left the original authors' names on them so that it didn't look like a "one man production.") I am sure that many other Society officers or Board members have experienced being measured against June's high standards; she was always protective of the Society, which she looked upon as "her baby" and her legacy. It will be a challenge for all of us in the future to continue to uphold those standards, which have stood us well over the past nearly 34 years. I am grateful to the Board for agreeing to name the Society Library in June's honor, and for granting permission for the Society logo, which she designed and drew, to be engraved on her tombstone, with the addition of "Founder - W.N.Y.G.S." beneath it. Aside from her interest in genealogy, June had many other talents. She was an avid golfer in her prime and shot four hole-in-ones, three of them in tournaments. She was an early advocate of computers, becoming proficient on an early model in the firm where she worked, a computer as large as a washer and dryer put together, with a hard drive the size of a shoebox with only about two megabytes of memory. Her first computer, which she bought in 1983, cost $10,000. She was always up on the latest technology and at the time of her death she had equipped her office with wireless. She finally convinced me of their value by lending me her old laptop and getting me started. She was also a talented photographer and at one time had her own darkroom. She copied all her old family pictures on high-contrast black and white film, and did all the developing, enlarging, printing, sepia toning, etc., another hobby that she taught me. In the last few years, we reversed roles and I became her mentor in gardening, which she took up with her usual determination and success. Over the years she owned many beloved pets, including a poodle named "Mignon" which she took to dog shows, but her beloved companion for the last 17 years was a Himalayan cat named "Shang-La," to which all visitors to her home had to be introduced. No memoir of June, however, would be complete without a mention of laughter and fun. She had a wonderful sense of the ridiculous and never laughed louder than when laughing at herself. Soon after starting the Society, June was in a golf tournament and was interviewed on local television. She called to tell me to watch for it, and when she came on screen, she was wearing two very different color shoes! The phone rang almost immediately and she was laughing. "Did you see my SHOES?!" She would recall funny things that happened to her as a young Red Cross volunteer at the old OLV hospital; once she was asked to wheel a deceased patient on a gurney down to the morgue and his wooden leg fell off onto the floor. Her favorite story involved getting her purse strap caught in a revolving door at a posh hotel in Toronto. She and her sister-in-law were stuck and tried to free themselves by pushing the door backwards but they were no match for the people pushing the other way. Finally the strap broke and the built-up pressure ejected June, landing her unceremoniously on her backside in the middle of the sidewalk! In the last few years we had dinner together every Saturday, and it was always a time of laughter and fun. That is what those of us who knew her will miss the most. W.N.Y.G.S. JOURNAL, Vol. XXXIV, No. 3, p. 99-100. Copyright © 2007 Western New York Genealogical Society.